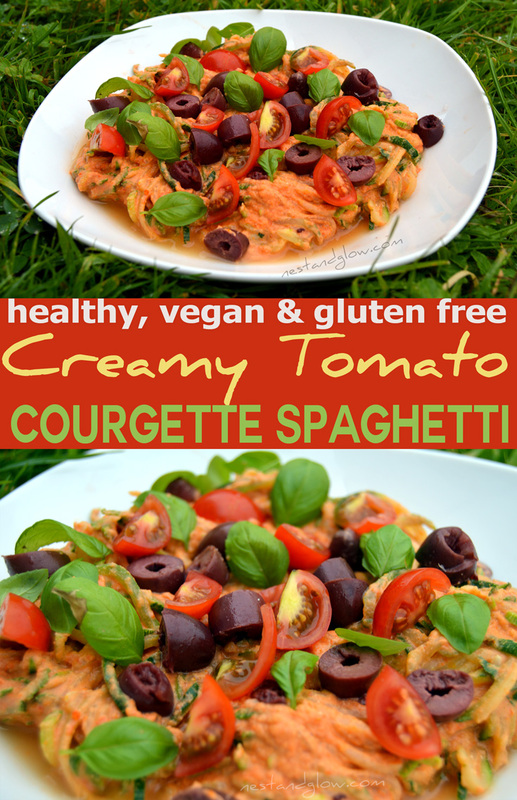 This is an easy recipe for creamy tomato sauce with courgette spaghetti. The sauce is creamy thanks to the cashews and has no oil added. You can either steam the courgette spaghetti for 30 seconds or leave raw. In the summer I prefer the raw spaghetti and in the winter when I want something warmer I have the softer cooked version. Top with anything you like, I find black olives, basil leaves and fresh tomatoes work well. To get a cheesy nutty taste try a teaspoon of nutritional yeast sprinkled on top. For extra crunch add some chopped up nuts such as macadamia or pine nuts. Cut the courgettes into spaghetti using your spiralizer / julienne slicer / vegetable peeler. To steam just boil a few tablespoons of water and stir the courgette for about 30 seconds. You can just eat raw, leave as is / massage in some salt or dehydrate at a low temperature to soften the courgette. Blend together all of the other ingredients until smooth to make the sauce. Mix the sauce and spaghetti together. 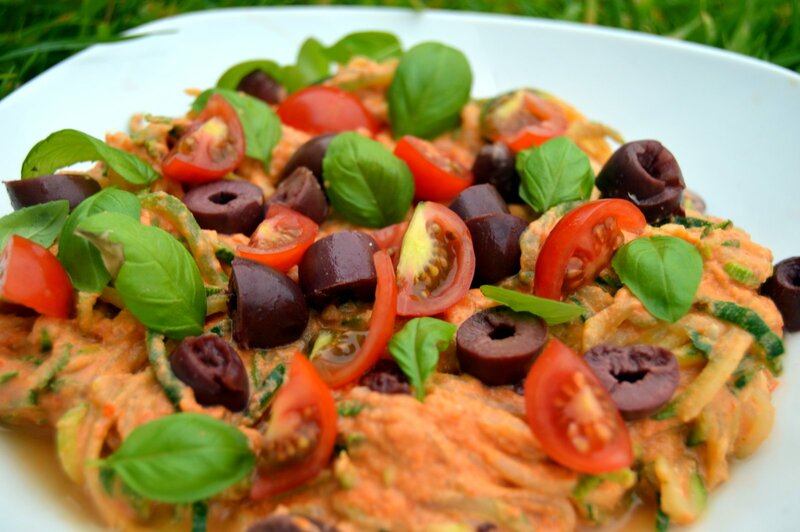 Top with anything such as olives, basil, chopped tomatoes and eat within 3 days. 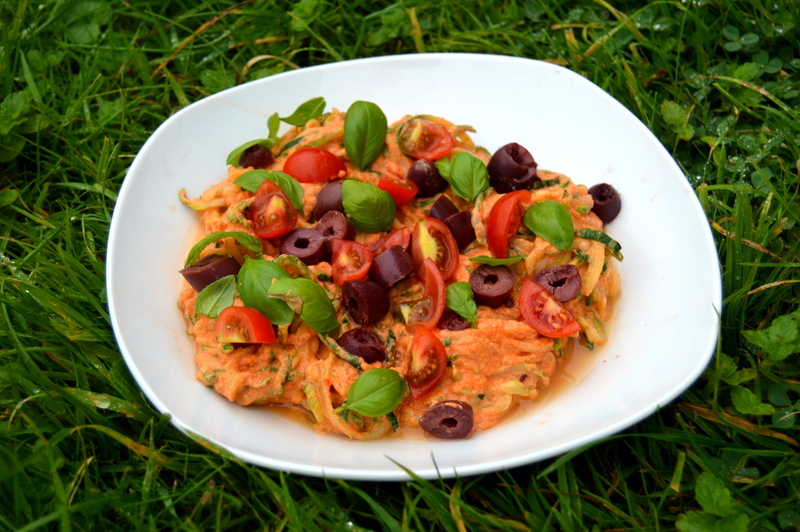 This Creamy tomato Courgette Spaghetti can be made either raw or cooked. For both versions the sauce is raw. 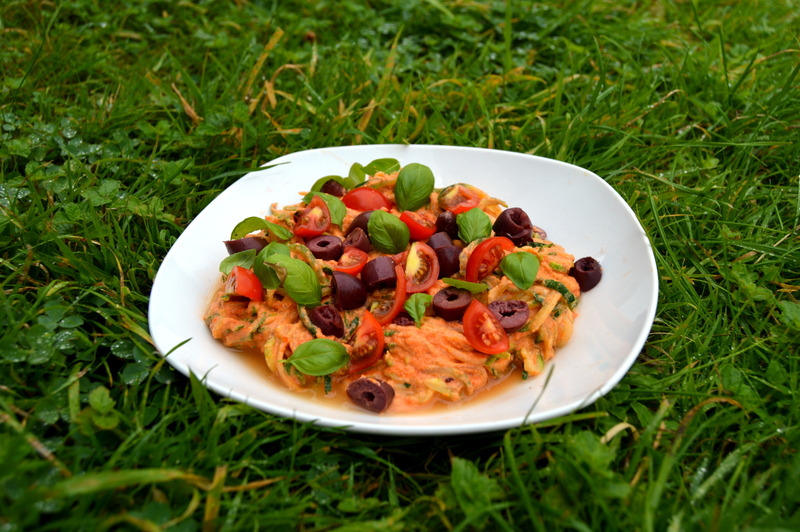 Creamy tomato Courgette Spaghetti topped with black olives, basil and chopped tomatoes. Other toppings that work well include peppers, pine nuts and nutritional yeast.